If you can provide the basic information, I can turn it into a great Press Release; Plus manual distribution to rank on Page #1 of Google News under 24 hours max. 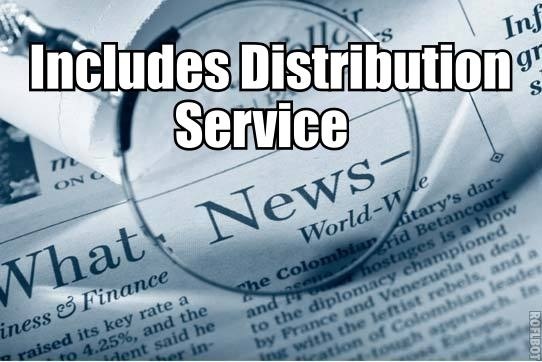 Professional Press Release PLUS Distribution! * Very high-quality Press Releases aimed at your target audience and dealing adequately with your subject matter. * Perfect spelling grammar and syntax. * A reliable and deadline-driven service. * SEO-optimised for search engine rankings >> Google Page #1 rankings under 24 hours. * Most importantly.. a high quality release for a sensible fee! * No software or bots, all submissions done manually. * Submitted to 15 top distribution services, and getting ranked on Google News and even Google.com for super-competitive keywords! * All submitted with your contact details and information. * The result is maximum exposure and reach immediately! I'll complete your press release and then begin the distribution as soon as you are happy with the release, with unlimited revisions if necessary. I'm just the writer you're looking for to get the attention-grabbing professional looking press release you need, so please feel free to get back to me with any questions!